The empowering spirit of the Olympics motto "Faster, Higher, Stronger" is increasingly out of step with the global decline in freedom and assault on human rights defenders over the past several decades. These problems are sometimes pronounced in Olympics host countries. 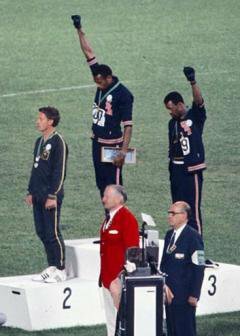 Smith and Carlos raised fists in Black Power salute at 1968 Olympics in symbolic act of civil resistance. Source: Wikimedia Commons.Thirty years later, Avery Brundage would again come under fire leading up to the 1968 Summer Olympics in Mexico City. OPHR succeeded in one of its demands. Under the threat of boycott and related international mobilization, the IOC eventually advised South Africa not to participate. During the 1968 Games, in a well-known instance, OPHR members Tommie Smith and John Carlos raised their fists in the Black Power salute after receiving Gold and Bronze medals — in solidarity with the broader civil resistance campaign (see left image). 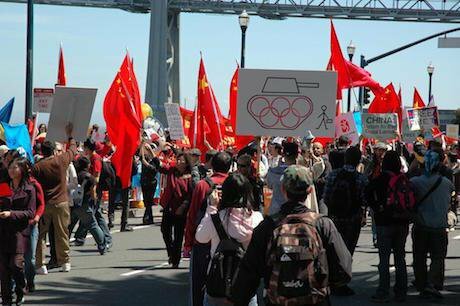 In 1980, western nations boycotted the Summer Olympics in Moscow in protest against the Soviet invasion of Afghanistan. As a result, only communist countries and their allies were in attendance. 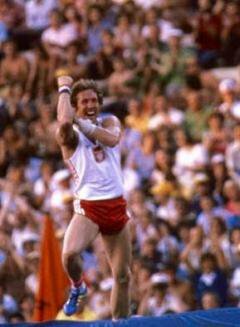 Polish pole vaulter Władysław Kozakiewicz made a provocative gesture (captured in the photo) to booing and hissing Soviet spectators and dignitaries present in the stadium upon winning the gold medal – beating out the Russian jumper Konstantin Volkov. In Poland, in the midst of the Solidarity struggle, his public defiance came to be known as the “Kozakiewicz gesture,” symbolizing the Polish nonviolent resistance to the communist regime and its Soviet backers. 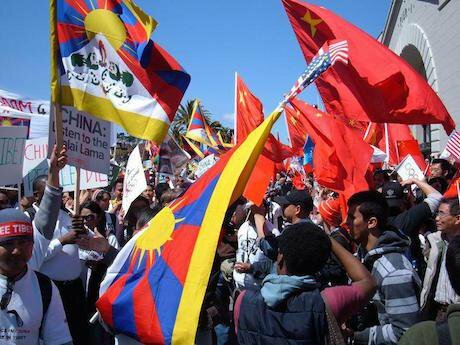 Tibetan rights protesters come face to face with pro-China counter-demonstrators along the torch route in San Francisco. Source: Wikimedia Commons. 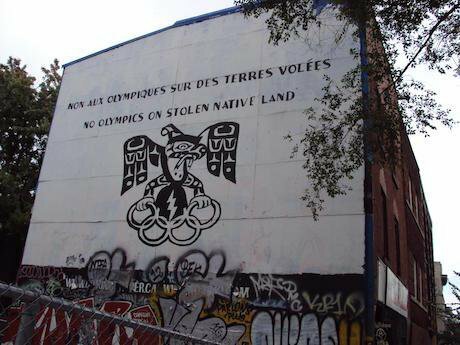 Vancouver activists raise concerns about land destruction and neglect for native peoples in the lead-up to the 2010 Winter Olympics. Source: Wikimedia Commons.At the 2014 Sochi Olympics, undoubtedly LGBTI issues took center stage. Many of the tactics employed by activists over the preceding decade were repeated, from international coordination in multiple cities to boycott movements. There was also a sense of rising disgust with the IOC and the Olympics in general. How could the IOC allow such a blatant violation of IOC Principle 6 on discrimination, asked the eponymous movement.